leviramsey wrote: MBTA for the most part has a penalty fare equal to the regular fare (Caltrain's penalty fare is $250 regardless of distance), the MBTA doesn't call it a penalty fare, and the MBTA has you pay the penalty fare immediately. Which of those is the significant difference? The names things go by aren't important for anything but marketing. .
Actually, the law makes it a significant difference. In Europe, if you are caught evading fares, you will be charges a high fine. The police officer will even walk you to the ATM. In the US, you get a ticket you have to pay at a later date. Why the difference? The constitution. Thats a little more important than marketing. Since the MBTA doesn't make it a criminal matter, the constitution has exactly zero to do with it. Rbts Stn wrote: True, no discount, but much convenience for folks who ride in 2-3 times/month and could buy a 10 ride every couple months instead of having to buy individual tickets each and every ride. Plus, the MBTA gets the revenue for 10 trips up front and has 9 fewer transactions to process. Accountants of all people should know the advantage of getting money up front and providing the service later. leviramsey wrote: MBTA aims for a 100% ticket/pass check rate (while Caltrain aims for a much lower proportion; also the MBTA's check rate is somewhere around 99%), MBTA for the most part has a penalty fare equal to the regular fare (Caltrain's penalty fare is $250 regardless of distance), the MBTA doesn't call it a penalty fare, and the MBTA has you pay the penalty fare immediately. No. The MBTA does not provide the ability to pay your fare fully ahead of time. It's not a ticket/pass check, it's a check and sale system. At peak times, this sometimes cannot be accomplished due to over crowding. So when a full ticket/pass check is not completed, POP hasn't taken place as many fares go uncollected. chrisf wrote: The commuter rail fare schedule is even more ludicrous if you look at how the fare works on the Needham Line, for instance. It's $2.10/2.25 to go from South Station to Forest Hills, but to go another mile to Roslindale Village, it's $5.75/$6.25. To go all the way to Needham Heights, it's only an additional $0.50. Clearly the outer Boston neighborhoods are disproportionately subsidizing the line. On the other hand, the riders to Roslindale Village are taking up seats that could have been sold to Needham Heights. Admittedly, on the Needham Line, that's less of a concern, but it is a consideration for Hyde Park. Since there's minimal interzone ridership, part of every commuter rail fare is effectively renting the seat to the outer terminal. That suggests that there is a finite number of tickets that can be sold on a Needham bound train, and that is incorrect. Every extra Roslindale rider is just an extra rider, no Needham revenue is being passed up. Commuter rail riders expect seats (witness the complaining about having to stand). On an inbound train, the Roslindale riders aren't taking up seats, but on an outbound train, they do. Consistently not being able to get a seat on the return trip at the margins pushes Needham passengers away. Even ignoring that, it's not clear that the outer Boston neighborhoods are disproportionately subsidizing the line. For a train going to Needham Heights (and where else could a train terminate? ), what's the difference in operating cost between a Roslindale rider and a Needham Heights rider? Well under a dime (basically all fuel), yet the Roslindale rider pays $0.50 less. MBTA recently tweeted that the intent for discontinuing the 10 trip tickets was to "reduce fare evasion." So now for those who use 10 ride tickets and are switching to singles, there are now 10x the transaction fees to MBTA, 10x the material costs, and MBTA gets less money up front. I'd have to guess MBTA is counting on inconveniencing customers enough that the 10 ride purchasers switch over to monthly passes. I don't think anyone at the T cares much about material costs. Witness the disposable monthly passes printed on rigid CharlieCards because the T couldn't integrate Charlie onto the commuter rail. At least in that case there's reduced wear and tear on the ticket reading machines since those passes don't have to have the magnetic strip read. 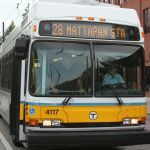 Rbts Stn wrote: MBTA recently tweeted that the intent for discontinuing the 10 trip tickets was to "reduce fare evasion." So now for those who use 10 ride tickets and are switching to singles, there are now 10x the transaction fees to MBTA, 10x the material costs, and MBTA gets less money up front. I'd have to guess MBTA is counting on inconveniencing customers enough that the 10 ride purchasers switch over to monthly passes. On days when conductors can't or don't collect fares then passengers with a 10 ride don't get punched. Based on Twitter complaints, it is a not infrequent occurrence - and usually due to overcrowding or some other operational situation that makes it impossible / unsafe for conductors to move through the coaches collecting tickets. So it isn't (in my mind) intentional fare evasion on the part of passengers and also not due to 'lazy' or irresponsible operations by train crews (as some Twitter trolls assert quite loudly), it is just an artifact of circumstances. Eliminating the paper 10-ride mitigates the problem somewhat, but doesn't completely eliminate it. Presumably some of the passengers will switch to mTicket single fares or 10 rides, and I'm sure that 'management' thinks people 'activate' their tickets as soon as they sit down (which would mitigate the problem of tickets not being checked - once activated, the ticket is used). My observation is that people don't 'activate' their mTickets until a conductor is almost to them, so I don't think the switch to mTicket will actually mitigate the 'fare evasion' problem. If former paper 10-ride passengers switch to monthly passes, then that certainly solves the problem. At the other end of the spectrum, some passengers might actually just buy multiple (many) single ride tickets, which won't mitigate the problem. My concern is that former paper 10-ride passengers will start paying cash (especially on inbound trains), which will present problems for train crews trying to collect fares on trains full of passengers. The paper 10-ride (or mTicket 10-ride) provides an advantage for passengers who (due to out-of-town business travel or any number of reasons) don't travel to Boston on the CR for enough trips to justify ('break-even' on) a monthly pass. Agreed, it isn't a cost savings or a discount and it is only a convenience, but if you're not travelling on the CR (or combined travel with subway) to justify a monthly pass, then there is no discount available, which makes the 10-ride attractive. Honestly, I think the 10-ride ticket is being scapegoated. Lets say someone buys a one-way ticket. Either way, if the conductor doesn't collect it, then the one-way doesn't enable fare evasion any more than a 10-ride. Sorry if I'm mistaken but I'm back in Boston after two years out in Seattle. It almost seems like there's been a price increase once a year for the last couple of years. Is this something I should expect if I stick around Beantown? theseaandalifesaver wrote: Sorry if I'm mistaken but I'm back in Boston after two years out in Seattle. It almost seems like there's been a price increase once a year for the last couple of years. Is this something I should expect if I stick around Beantown? FMCB vote to increase fare included a provision that next fare increase won't be until January 2019. Fares should increase at the rate that the MBTA's costs increase, which is at least 5% a year. BandA wrote: Fares should increase at the rate that the MBTA's costs increase, which is at least 5% a year. MBTA costs shouldn't be going up at least 5% a year, not if they can get their act under control. At least not while inflation and the CoL isn't going up by that amount.